The new 6-cylinder cars of BMC launched in 1959 followed the farina styling of the 4-cylinder models but without such prominent rear fins. 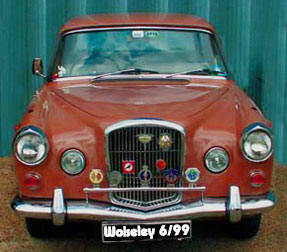 The Wolseley 6/99 was exactly the same car as the A99 Westminster except that the interior was more up-market with walnut veneers and the front end had the Wolseley grille with illuminated Wolseley badge and front fog lamps and different bonnet. The new cars had a level of dignity far above their Ford and Vauxhall competition and were intended for people who aspired to the Rover/Humber end of the market. Under the bonnet there was a bored out 3 litre version of the BMC C-series engine with twin SU carburettors – almost the engine introduced in the new Austin Healey 3000. It was coupled to a 3-speed gearbox with Porsche developed synchromesh and fitted with overdrive on top and second gears giving the driver 5 gears to play with. Steering and suspension followed previous Austin practice but in the braking department the new A99 now had Lockheed disc brakes on the front wheels. It was intended to introduce an Austin A120 Vanden Plas version but there was a quick re-think and the project was dropped. There was one A99 Countryman built which saw service in the BMC competition department as a spares barge. The 3 Litre Princess was introduced at the 1959 Motor Show but was only distinguished from its BMC stable mates by the front grille and interior. Badged as the Princess meant that it could be sold by Austin as well as Nuffield dealers. As the general public kept referring the new Princess 3Litre as an Austin so BMC created the Vanden Plas as a new marque and the car were re-named in 1960. Layout: Unit-construction pressed steel body-chassis structure, 4-door, 5-seater saloon with the engine in the front and rear wheel drive. Engine and transmission: BMC C-series engine; 6 cylinder ohv, in-line 2,912cc, 83.34x88.9mm, 103bhp at 4,500rpm; 158lbs ft at 2,000rpm; 3-speed gearbox, all synchromesh: Borg-Warner overdrive standard on top and second gears; optional Borg-Warner automatic transmission; live (beam) rear axle with hypoid-bevel final drive. Maximum speed 98mph; 0-60mph 14.4sec. fuel consumption 19mpg. Chassis: Independent front suspension, coil springs, wishbones and anti-roll bar. Cam-and-lever steering. Rear suspension by half elliptic leaf springs and anti-roll bar. Front disc and rear drum brakes. 7.00x14in tyres. Dimensions: Wheelbase 9ft 0in; front track 4ft 6n; rear track 4ft 5.25in; length 15ft 8in; width 5ft 8.5in; height 4ft 11in. Unladen weight (approx.) 3,305lbs. Engine: BMC C-series engine, 6-cylinder 103bhp at 4,750rpm; 157bhp at 2,300rpm, Maximum speed 97mph; 0-60mph 17.9sec; fuel consumption 17mpg.